Support us with our Puppy Fund Appeal and help us to transform lives. Can you support us with our Puppy Fund Appeal? £5 could help fund essential preventive medications for two new puppies to protect them as they start their training. £10 could help feed a litter of hungry puppies with specialist puppy food for a week as they start their journey to become life-changing assistance dogs. £25 could help fund individual training sessions with our specialist puppy trainers throughout their first year. Your donation – whatever you can afford – will mean we can increase the number of puppies starting their journey to become a canine partner as soon as possible. 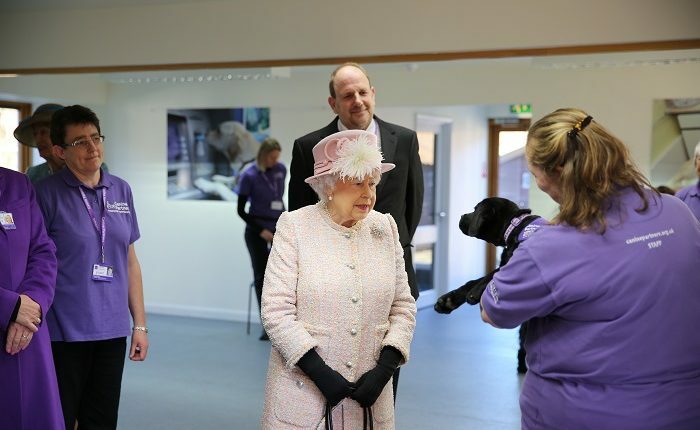 Puppies like Flint, who met Her Majesty The Queen when she visited our Southern Training Centre last year. This winter Canine Partners is facing our biggest challenge, and we’re appealing for your help. As word has spread of the huge difference one of our dogs can make to a person’s life, more and more people are realising the need to apply for a canine partner. This is wonderful news, but without increasing the number of puppies entering our training programme in 2019, we simply won’t be able to train enough dogs to continue to transform lives in the coming years. Demand has been so high that we’ve had to make the tough decision to close our waiting list, but we’re working hard to open it again in 2019, and we need your support to do that. We’re so proud of what our trained assistance dogs can do. It is wonderful to watch the eager, excited bundles of energy that start their training develop into intuitive, dependable companions. 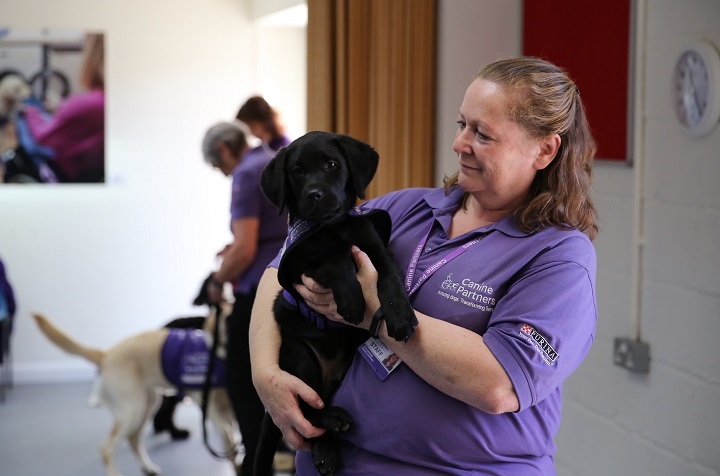 It takes over two years and more than £10,000 to train a puppy to become a fully-fledged Canine Partners assistance dog with the first 12 months of puppy training alone costing over £5,000. Meet Flint, a black Labrador born on 5th September 2017. After careful assessment, he was purchased from a private breeder. Puppies usually cost around £1,000 to purchase. Breeding and litter assessments enable us to make certain that we select puppies with excellent temperaments and high health standards to give them the best possible chance of success in their training. At eight weeks old, Flint met his volunteer puppy parents and started his journey to becoming a canine partner. 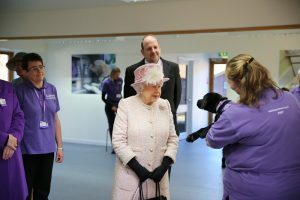 Little did he know that he would soon meet an incredibly important visitor to Canine Partners. In November 2017, Flint met her Majesty the Queen on her visit to the Southern Centre. Flint’s puppy parents are just two of over 150 amazing Canine Partners volunteer puppy parents across the UK. They devote their time and energy caring for our puppies in their homes, ensuring their health and well-being is their top priority. With support and guidance from the puppy training team, they socialise the puppies in the community so they are ready for anything that comes their way. 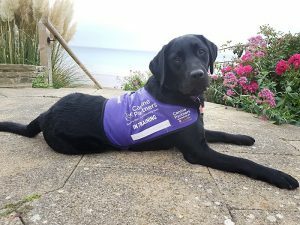 Flint’s specialist food, equipment and veterinary costs throughout puppy-hood have all been taken care of by Canine Partners, ensuring he has the very best start to his training. For a puppy like Flint, those vital first 12 months cost over £5,000. In December of this year, Flint will head back to our Southern Training Centre in West Sussex to begin his advanced training. He’s already learnt the basics with his puppy parents but now it’s down to the advanced training team to focus on key tasks like opening doors, unloading and loading the washing machine, and much more to prepare him on his mission to transform the life of a person living with a disability. To help us re-open our waiting list and meet the growing demand for partnerships, it’s absolutely vital that we know we have the funds to select, socialise and train more puppies like Flint. 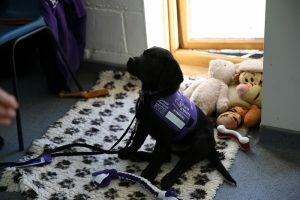 Please support our Puppy Fund Appeal this winter and help Canine Partners transform lives in 2019, and beyond. When donating online, please select the Puppy Fund Appeal in the Donation Type drop-down so that your generous donation is dedicated to our appeal. Alternatively, you can make a donation by telephone by calling us on 08456 580 480 and quoting “Puppy Fund Appeal”.